Decoraport 40 In. Wall Mount Bathroom Vanity Set with Single Sink and Mirror (T5167A),with beautiful exteriors offset by modern Aluminum alloy door pulls. Each vanity provides a full complement of storage areas behind sturdy soft-close doors and drawers. A wall-mounted vanity leaves space in your bathroom for you to relax. 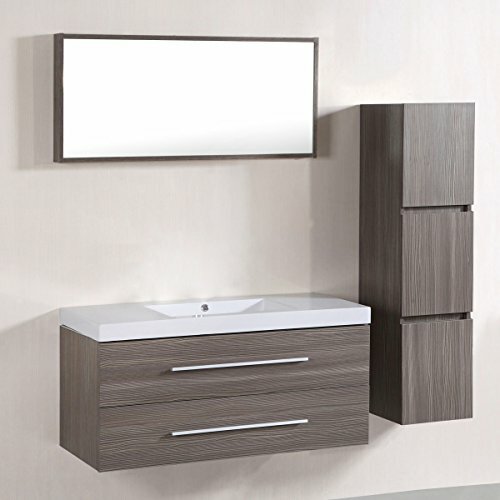 The simple clean lines of the wall-mounted vanity set are no-fuss and all style. Unique and striking contemporary design. Modern Wall-Mount Design. Fully-extending soft-close drawer slides. Single-hole faucet mount. Faucet(s) not included. Rectangular Sinks. Backsplash available. Composition: 1 cabinet, 1 basin, 1 mirror, 1 side cabinet. Material: multilayer board; Surface treatment: paint. Resin basin and aluminum alloy handle. Size of Cabinet : 40 In.x 18 In.x 19 In. Size of Mirror : 40 In.x 18 In. Size of Side Cabinet : 14 In.x 12 In.x 47 In. Package Weight : 150.0 Lbs. Material: multilayer board; Surface treatment: paint.Effective buffer door. If you have any questions about this product by Decoraport, contact us by completing and submitting the form below. If you are looking for a specif part number, please include it with your message.